Greetings from RTU and a warm welcome to all our new subscribers and sponsors. We started the new academic year in our schools in June. It gave us immense pleasure to welcome all the pupils back. We bid farewell to Fr Bosco and Br Peter as they are moved on by their respective communities. This usually happens every three years, but we have been lucky to have had Fr Bosco with us for four. They have touched many hearts, taught many minds and transformed many lives. They have served at RTU with dedication and we thank them for their committed service. In their place, Fr Maria Antony has joined us to head our education department and Br Vinoth will be in charge of purchasing. We welcome both to RTU. RTU Alumni arranged a blood donation campaign. 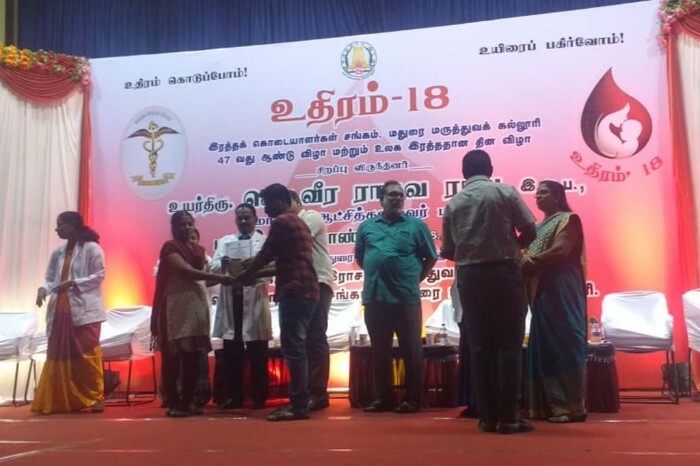 It has been recognized by Madurai Medical College and Mr Ganesha and Mrs Vijitha accepted the award presented by the District Collector on behalf of the Alumni. We feel very happy and proud to share with you our achievements and we have some news of recent weddings of some of our children who were in our care. On 3rd June, Geetha married Mr. Nandhakumar in her village temple. Geetha came to RTU in 2010 and, with our support, she studied General Nursing and Midwifery at the Claudine School of Nursing in Batalagundu. She was working in Leonard Hospital and, when our beloved Br James became ill, she accepted our request to come to RTU to nurse him. She took care of Brother very well until he died and since then, she has worked in RTU’s Pushparani Medical Clinic. The bridegroom’s family arranged the wedding in a very grand manner in their village. Many staff attended the betrothal ceremony and wedding too and wished them a happy married life. On 4th June, Rajalakshmi married Mr Vengatesh. 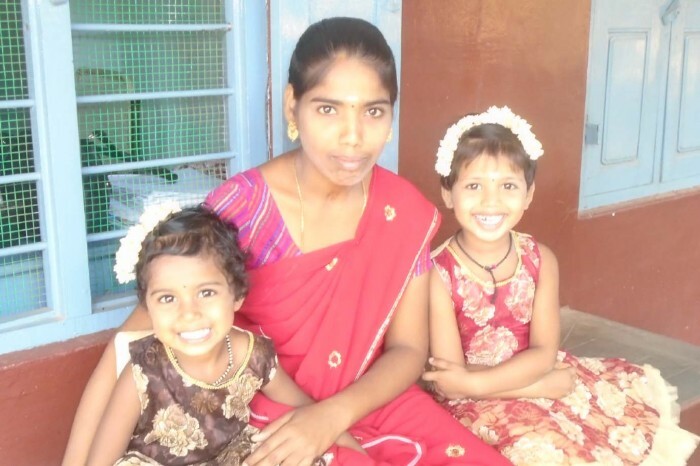 Rajalakshmi came to RTU in 1998 with her mother and younger sister. Her mother joined RTU as a foster mother until she left to arrange both her daughters’ marriages. Rajalakshmi finished her Diploma in Special Education and now works as a Special Educator in a private school in Madurai. 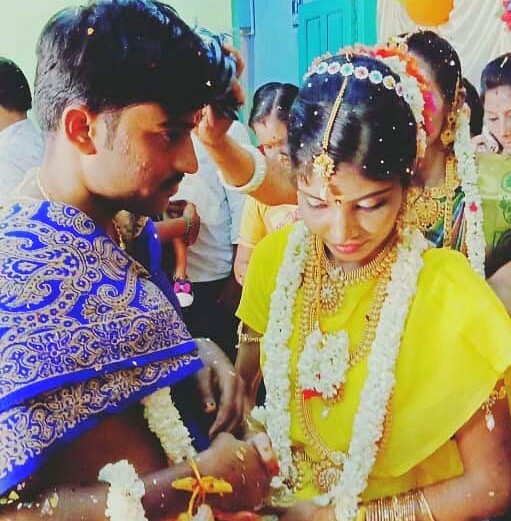 On 17th June one of our former students, Mahalakshmi, married Mr Selvamani in a village temple. The bridegroom’s family arranged the marriage ceremony as both the bride’s parents had died. Mahalakshmi and her younger brother, Manikandan, came to RTU in 2005. 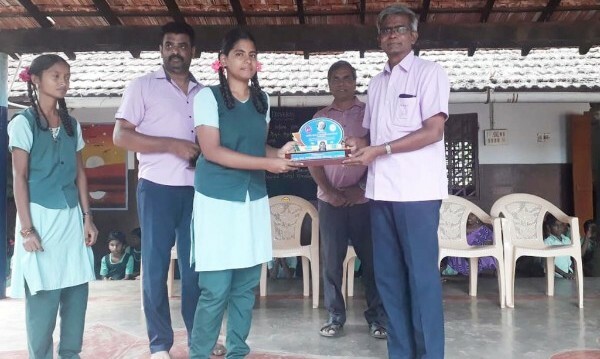 Mahalakshmi completed her Diploma in Electronics & Communication in Kammavar Sangam Polytechnic College, Theni and she now works for a private company in Chennai. Sivaranjani and Saranya have successfully completed their 12th standard exams in our school and both have places to study for a BA in Tamil and a BA in History respectively in Jeyaraj Annapackiam Women’s College in Periyakulam. They will live in Jeevan Jyothi Hospice. 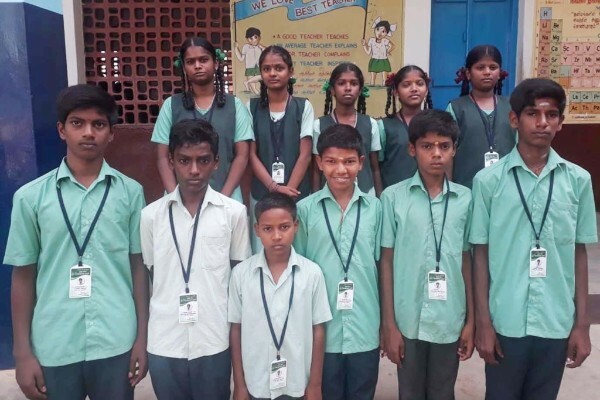 Six of our students have successfully completed their 2-year Diploma in Special Education in the Spastics Society of Tiruchirappalli and have found good jobs in various schools as Special Educators. We wish them a bright future. Mrs Gayathri, a 26-year old orphan was brought up in Gandhigram Children’s Home. With their help, she got married and has two girl children. Her husband died due to cardiac problems in 2017. After that, she found it difficult to cope with the children without an income. To get support for her children’s education, she went back to Gandhigram Home. Seeing the poor condition of the mother and children, they referred them to RTU to become a foster mother with the children. We happily admitted them in our Miriam Children’s Village. Now Gayathri feels very safe and secure. Her children, Mahalakshmi and Divya, are also enjoying their childhood with their new friends. Our Senior Mothers and our Child Care Manager trained her up and gave her the confidence to move forward following her trauma. Now Gayathri is taking care of another five children in a separate house like our other mothers and is leading a settled life. On 1st June all our balwadies (pre-schools) and schools opened for the new academic year. Our teachers joyfully welcomed all the children with the eyes of hope and a brighter future, and new textbooks, uniforms and writing materials were distributed to all the children. All the class teachers visited their children’s homes to know more about their family circumstances and to get a better understanding of the children. On 12th June, we celebrated the Holy Ramalan festival. 15 muslim leaders from Genguvarpatti village mosque organized a prayer service for our children. They spoke about self-control, faith, prayer, charity and the pilgrimage and the occasion was very inspirational. These types of celebrations help to give our children experience of different faiths and inculcate values of tolerance and peace in their young minds and hearts. The Smt Savithri K Oza Memorial Prize was awarded to the school toppers in memory of the mother of Dr Oza, RTU’s President and Chair of the Board. The Alumni of RTU also gave Rs 1,000 for 7 toppers in class 10 and 12. We wish them all the best. 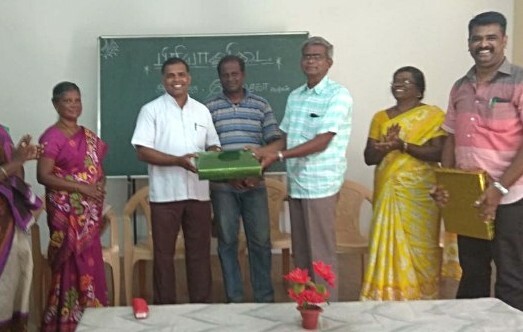 Fr Sahayaraj gave a weeklong ‘Healing the Inner Child’ training for class 11 students. Our students enjoyed the classes and found them very useful. To create a greater awareness of democratic beliefs, RTU’s schools organized the ‘Balarshaba’ Student Parliament along the lines of the Indian General Election. The contesting candidates went around canvasing votes by promising effective performance of their duties. After the election, all the schools had swearing-in ceremonies where the responsibilities were conferred on those elected to represent their classmates. On 21st June, International Yoga Day was celebrated in our Nirmala Middle School in Bodi with great enthusiasm. Our students were taught yoga by a specialist from Jeeva Jothi Yoga Centre in Theni. All our students demonstrated various asana followed by omkar chanting. The teacher encouraged students to practice regular yoga to remain fit and improve concentration. Our health clinic has served 19,200 visits by patients over the last year. 65 elderly and destitute people from 23 villages receive support for their daily sustenance. 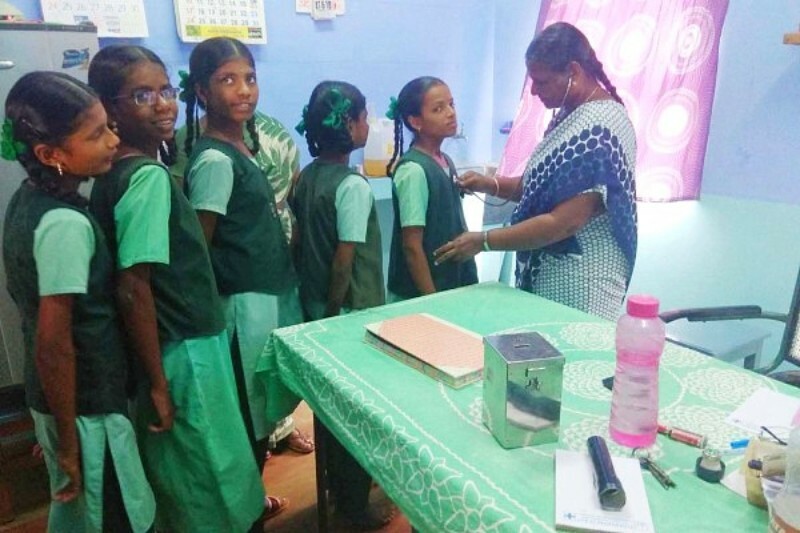 Medical check-ups were carried out for all our school children by our Pushparani Clinic team from 10th to 30th June. In total, 1,424 school children underwent medical check-ups. The children who had chest problems and other common illnesses were referred for immediate treatment. 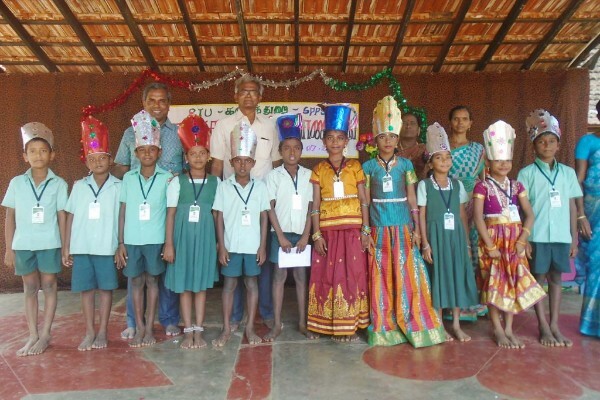 100 children from 89 families living in 51 surrounding villages receive assistance for their education. Among them, 6 children are HIV+ and 52 families are affected by HIV. 40 children from the Home Support Programme in rural villages passed their 12th standard Government exams and among them 7 students (Engineering BE - 1, Diploma in Mechanical Enginnering - 1, ITI - 2 and Teacher Training - 3) are now being supported through the JK Scholarship Fund for their technical and professional training courses. 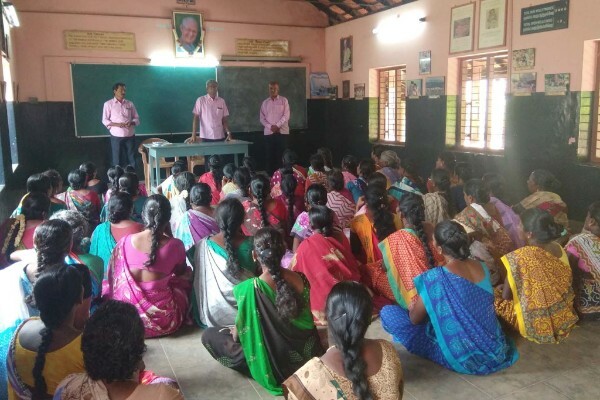 A training day on watershed management was organized on 21st June in Ranganathapuram village by Tamil Manila Pengal Iyakkam (TMPI). 36 Self Help Group members from surrounding villages participated in this training and received awareness on the deepening and protection of local ponds. Mr Annamalai from the climate change awareness movement was the resource person for this training. A training day on dairy cows was organized on 29th June in Sathakoilpatti village by Tamil Manila Pengal Iyakkam. 40 women Self Help Group members received training on Azolla cultivation, prevention of foot and mouth disease, Anthrax, timely vaccination, low-cost value-added dairy products and direct marketing. Since Azolla feeding improves the health of cows and boosts milk yields, our members were encouraged to use Azolla to get extra income from improved milk yields. There are 127 Self Help Groups in 30 villages with 2,308 women members. The groups also run 11 evening study centres or supplementary schools for the poorest children in their villages and 410 children attend these. We provide the children notebooks and food. In the last year, 46 houses have been constructed in 11 villages. This increases the total number of houses that RTU has built for the poorest families to 8,799. In the last year, 11 water facilities (bore-wells with motor pumps) were drilled and the total number of water facilities that have been provided in our target villages is 2,465. We are grateful to all the supporters who have sent funds to build whole houses and wells. Thank you for all your generous contributions and sacrifices, which have borne fruit in sixty and a hundred-fold. We would like to take this opportunity to thank you for your support for the academic excellence in our schools and achievements in our programmes. Your valuable gift is helping us to provide long-term support for children under our care. It is your generosity and belief in our service that enables us to perform this work, and we are deeply grateful for your partnership. My heart is as always filled with profound gratitude for you.